“My work at Hall Office Park is a real and functional object in some sense and a metaphorical one in another. It is the structure for living plants to grow into, guided by, but not limited by the grid and the rolling, turning, twisting forms of the metal rods. The vines first grow following these predefined paths. However, by a greater natural compulsion, successive growth begins to leave the path to set out on new courses. Jim Cinquemani lives and works in Dallas, Texas. He studied at the University of Syracuse in New York and at the University of Dallas in Irving, Texas. He also served an apprenticeship with the famous sculptor, Heri Bert Bartscht for two years. 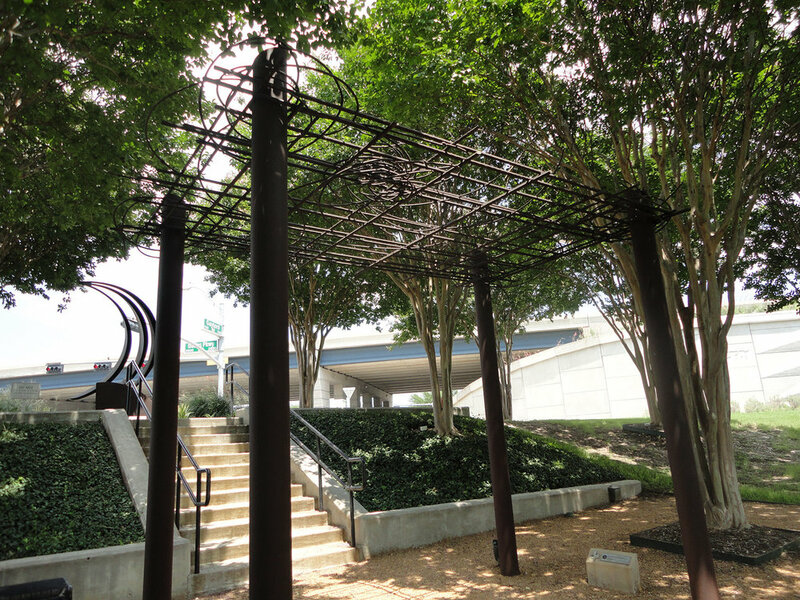 Mr. Cinquemani has worked with major Texas architects to design and produce architectural elements for buildings such as Exposition Plaza, First National Bank, Providence Towers, Camp House at the Arboretum, the Bridwell Library at SMU, and the Meyerson Symphony Center. He has been commissioned by many private collectors to produce special works for their homes. Mr. Cinquemani is well-known for his metal furniture, gates, light fixtures, and arbors. He has also worked in collaboration with other artists for national projects. He has received patents for 14 separate designs. His patented letter opener was featured in the Neiman Marcus Christmas catalog. In 1991 he was awarded the Craftsman Award from the AIA Dallas chapter.